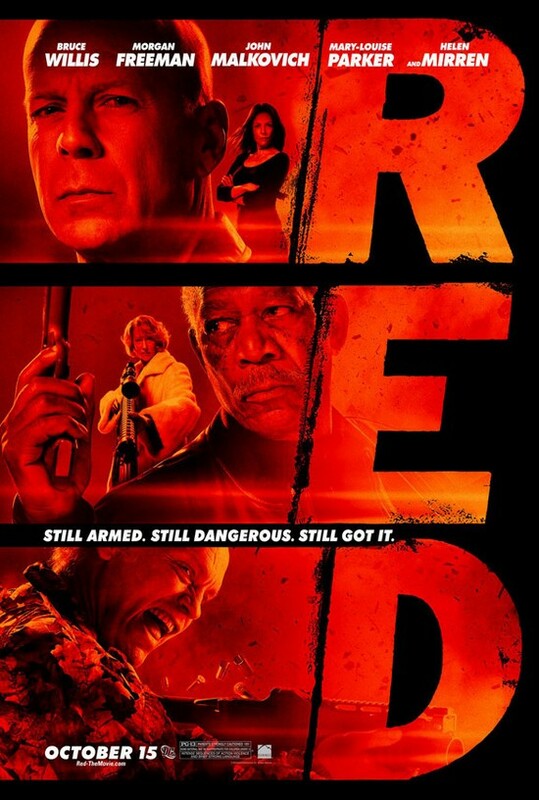 RED is not typically what I watch with my take-out sushi, but…Helen Mirren. If I’d known she was in it and if I’d known it was an action comedy thriller, I would have watched it sooner, but better late than never. Based off a comic book series, the movie has fun with genre conventions and balances the right mix of punchy action and well timed humor with a very classy cast to boot. People who like shoot-em-ups and those who aren’t so keen can enjoy it, even if they don’t agree on the sushi. Bruce Willis leads the ensemble as Frank Moses, a lonely pensioner whose one highlight in life is tearing up his retirement checks so that he can phone up the call center and chat with Sarah (Mary-Louise Parker). He’s not just a bored retiree, however, he’s a bored retiree who was engaged in black-ops for the CIA. This marks him out as a RED – retired, extremely dangerous, and it’s why his former agency has sent a whole football team of assassins to his home in the Cleveland suburbs in the middle of the night to take him out. It’s not immediately clear why he’s being targeted, but we know who is trying to kill him. Agent William Cooper (Karl Urban) is getting orders from his superior, Cynthia Wilkes (Rebecca Pidgeon), who is getting orders from someone higher up, and all of it seems to point towards an arms dealer (Richard Dreyfuss) and a decades-old operation in Guatemala. As Frank flees from assassins, he crisscrosses the country picking up clues and some old colleagues. The man keeps pretty good company. Sly Joe (Morgan Freeman) may be dying from liver cancer, but he’s living it up in a nursing home. Frank’s best friend, Marvin (John Malkovich), is more of a loose cannon and a real conspiracy theorist, but he’s also a damn good shot. The group even includes an old Russian associate, Ivan (Brian Cox), who knows how to infiltrate government buildings better than his American friends, of course. The grand dame of them all is Victoria (Dame Helen). She’s taken to baking and flower arranging in her second life but still does a contract killing or two on the side, you know, to stave off boredom. The fun comes not from the team’s advanced age and rusty skillset but from their extreme competence. These guys are as sharp as ever, and even handsome, deadly Agent Cooper struggles to keep up. Willis, no stranger to the genre, leads with a steady hand, facilitating all the action you’d expect, but it’s the other actors who lean into their stereotypes and surprise with killer turns. It’s not unusual to see a paranoid Malkovich, for example, but his run-in with a Coldwell Banker agent leads to hilarious fireworks. The same is true for Mirren, who explains that she’s a killer with the same tone as a beloved grandmother reminding you to please get more rest. Queen also looks a beast clutching a machine gun while wearing a milk white evening gown. If it all sounds a little sadistic, it’s not. The thrill for Frank’s hit team is doing something they are damn good at, and for Frank in particular, this latest improvised operation might be what he needs to get through an existential crisis. While his friends seems to be getting on with their lives, he’s struggling. Pairing him up with Sarah isn’t the best option though. Their relationship is a handy plot device, and the climax hinges on the girlfriend getting kidnapped, but you’d think the filmmakers, who have put a creative twist on every other aspect of the movie, would come up with something more interesting. Poker-faced Willis doesn’t have that much chemistry with Parker, and her character is mostly one note, a quirky singleton from Kansas City, Missouri who reads too many romance novels and longs for an adventure. As a quirky singleton from St. Louis, Missouri though, I think Sarah would be better off staying in state. Posted in USA, Western movie reviews and tagged action movies, Bruce Willis, comedy, Helen Mirren, John Malkovich, Karl Urban, Morgan Freeman on August 30, 2018 by limmer13.